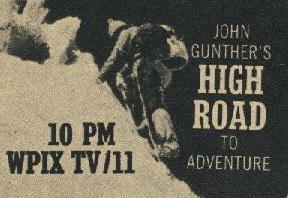 syndicated title: "High Road to Adventure"
journey from his home in the foothills of the Himalayas to the University of Lahore. John Gunther, narrator. Adventure: Beauty, brutality and tenderness in the struggle for existence among animals and birds in "Survival,"
filmed in Swedish forests and on the cliffs of the Baltic sea coast. Contrasting challenges and hazards of mountain climbing and cave exploration will be shown in "Caves and Mountains." Copyright © The Classic TV Archive. All rights reserve.